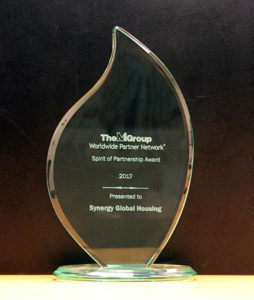 In receiving TheMIGroup Worldwide Partner Network® Award, Synergy reinforces its commitment and dedication to delivering high-quality services, not only to TheMIGroup’s clients, but also to our own clients and their employees. Accepting the award on Synergy’s behalf was our Supply Chain Manager in EMEA, Kela Breslin. Founded in 1999 and based in San Ramon, California, Synergy Global Housing brings a superior furnished housing experience to the business travel and workforce mobility industries. Synergy provides best-in-class serviced accommodations in more than 55 countries, and has Global Solutions Centres in: Dublin, Ireland; Hyderabad, India; Singapore; San Ramon, San Francisco, Los Angeles, and San Diego, California; New York City; and Seattle, Washington.  Through our people, passion and innovation, Synergy delivers boutique services, custom-tailored to meet each client’s individual needs on a worldwide basis. Synergy is routinely recognized for being a leader in its industry. Awards received in the last year include the GOLD Supplier Excellence Award from Lexicon, Global Relocation Service Partner of the Year, Consultants Choice Award from Graebel Relocation Alliance, and a Circle of Excellence Award from Aires. The Ascott Limited is a Singapore company that has grown to be one of the leading international serviced residence owner-operators. It has over 43,000 operating serviced residence units in key cities of the Americas, Asia Pacific, Europe and the Middle East, as well as over 31,000 units which are under development, making a total of close to 74,000 units in over 500 properties. The company’s brands include Ascott, Citadines, Somerset, Quest, The Crest Collection and lyf. Ascott’s portfolio spans more than 120 cities across over 30 countries. Ascott’s achievements have been recognized internationally. Recent awards include DestinAsian Readers’ Choice Awards 2018 for ‘Best Serviced Residence Brand’; World Travel Awards 2017 for ‘Leading Serviced Apartment Brand’ in Asia, Europe and the Middle East; TTG China Travel Awards 2017 for ‘Best Serviced Residence Operator in China’; Business Traveller Asia-Pacific Awards 2017 for ‘Best Serviced Residence Brand’; Business Traveller UK Awards 2017 for ‘Best Serviced Apartment Company’ and Business Traveller China Awards 2017 for ‘Best Serviced Residence Brand’. Founded in 1978, TheMIGroup is a leading provider of global relocation management solutions. We offer a full range of relocation solutions including Domestic and International Services, Compensation and Consulting Services – from total assignment management to individual services for transferees, expatriates or individuals on the move. With full service business units strategically located throughout The Americas, Europe and Asia, and with TheMIGroup Worldwide Partner Network® located in over 150 countries, we have the capacity and capability to provide professional services across all time zones. For more information, visit www.themigroup.com.